Explore our stunning collection of VEKA windows to find your perfect fit. Contact the Malvern Glass team for details or use our online windows design tool to explore different possibilities. Our collection of uPVC windows is so extensive, you’re bound to find a style to suit your home in Ledbury. We only use products of the highest quality, which is why we decided to team up with VEKA: a recognised innovator and market-leader in the double glazing industry. Superb aesthetics and strong performance come as standard with this collection. Rather than offering standardised ‘off-the-shelf’ solutions that are uninspiring, we consult closely with our customers – so that we can uncover their requirements and design uPVC windows that look stunning. We’ve even created a design tool that’ll allow you to explore different ideas before contacting us. Visit our free quoting app today and get started. If you live in Ledbury – or the surrounding area – and want to update your uPVC windows, choose Malvern Glass. You’ll benefit from improved thermal performance and a more secure home – not to mention improved market appeal. Call or email our team now to arrange an appointment, ask us a technical question or request a free quotation. To give our customers in Ledbury as much choice as possible, we’ve teamed up with some of the UK’s best supplier and manufacturers of uPVC windows. Explore your options in detail and find design ideas for your renovation or home improvement project, then get in touch to discuss your ideas with our team. Our VEKA uPVC windows are built to meet industry guidelines and comply with local planning permission rules and building regulations. We will make sure that your double glazing is fully compliant, so as to avoid any issues with red tape further down the line. This doesn’t mean that your choices will be limited; to the contrary, we’ll make sure that your proposed windows add genuine kerb appeal to your Ledbury home. It’s not just about the uPVC windows you’re thinking of buying; it’s about the installer you’re thinking of choosing, too. Malvern Glass has in-depth knowledge of every window in its VEKA range and can support your requirements by directing you to other products in its online catalogue, should you be planning a refurbishment project. 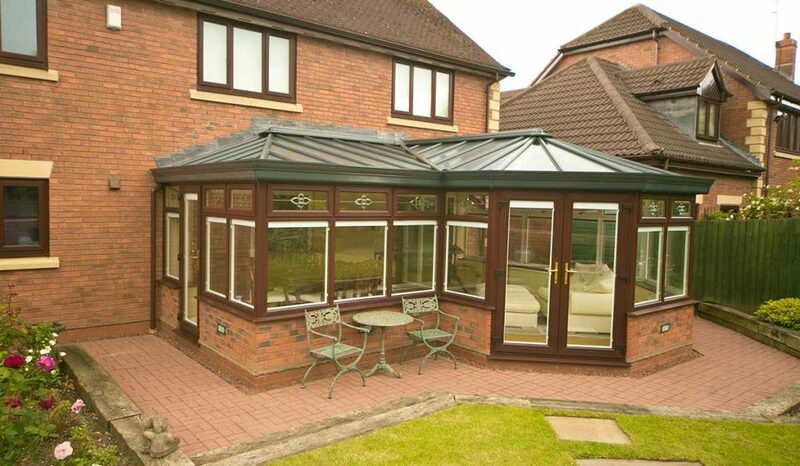 You’ll be delighted with the uPVC windows that we install at your property. If you love the look of our VEKA uPVC windows range, you’ll be pleased to hear that we offer a range of styles to suit the architecture of your home. Keep reading to find your perfect fit and get in touch when you’re ready to discuss your requirements. Casement windows continue to be a popular choice with our customers in Ledbury. Not only is this style affordable, it blends in anywhere, making it the perfect choice for modern and traditional properties alike. Further improve the look of your uPVC casement windows by selecting from our diverse catalogue of colours, textured foils, glazing and window furniture. Your home is bound to stand out from the local crowd. This style of double glazing tilts and slides, which means it’s possible to capture passing breezes more effectively and ventilate your home – preventing unwanted problems like damp and condensation from occurring. Our vertically sliding uPVC windows perfectly replicate the look of timber, minus the extensive maintenance and upkeep. You’ll have more free time to devote to other projects in your Ledbury home when you choose this option. Enjoy enduringly-traditional aesthetics with our VEKA flush sash windows, while benefiting from modern technology that delivers outstanding performance. Your uPVC windows will be designed and installed in accordance with local planning permission requirements, removing the possibility of problems later on. Create more internal space and a remarkable external feature that will catch the attention of anyone who passes or comes to visit at your home in Ledbury. Bow or bay windows let in more light and will make your home more marketable, should you decide to sell at some point in the future. Our tilt and turn windows are unique, in that they open inwards, which means you can let cooling breezes into your home without compromising your security. Whichever of our VEKA uPVC windows has caught your eye, the Malvern Windows team will be on hand to advise you and meet the demands of your new project. With extensive experience of designing and installing uPVC windows in the Ledbury area, Malvern Glass has an excellent local reputation. Contact our team today for expert guidance or to arrange an appointment, or use our window design tool to get an online price in just a few minutes.